Data! Data! Data! That word is everywhere these days! Administrators are asking for it, PLC’s spend time analyzing it and teachers are asked to collect it. But how does data collection mesh with creativity and learning in the art room? In actuality, there are endless ways to collect data in the art room. I would be willing to bet that you already are doing a lot of these things. It is just a matter of taking them to the next level. And, best of all, you don’t need to feel anxious about collecting data. On a positive note, data and assessments can be used to demonstrate student growth and advocate for our program. 1. 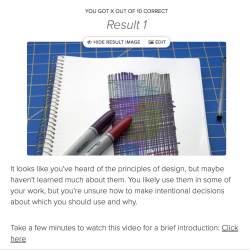 Design and create a Pre-Post test for a unit or class and collect the results. For details on how to do this, check our Sarah’s articles: Part 1 and Part 2. 2. Record the results from a project rubric. You will need to make sure your rubric has numeric values in order to collect data, but that is really a little tweak. Even if you use a smiley face or other graphic rubric scale, you can easily assign numeric values to each graphic when you record scores. Results from a project rubric could allow you to compare student scores over time or compare student scores to teacher scores. 3. Track the number of students completing homework sketchbook assignments each quarter. Is your feedback making an impact? 4. Tally the number of students participating in a class critique. You could compare different grade levels, male vs female participation, or one class throughout the course of the school year. 5. 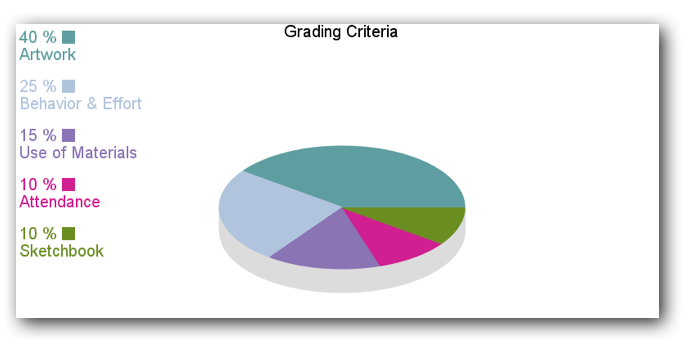 Use a pie graph to demonstrate the breakdown of a specific grade or project. To make a super easy pie graph online check out Piecolor. 6. 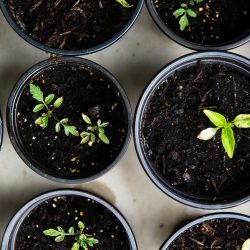 Use a checklist to collect project scores for two classes. 7. Track parent participation as you try a new idea to get parents involved, such as a portfolio checklist with parent prompts or a class newsletter. 8. Collect the results from a project-based assessment, like having students assemble a color wheel or sort color families. Maybe you could utilize a parent volunteer to assess students in small groups in the hallway? 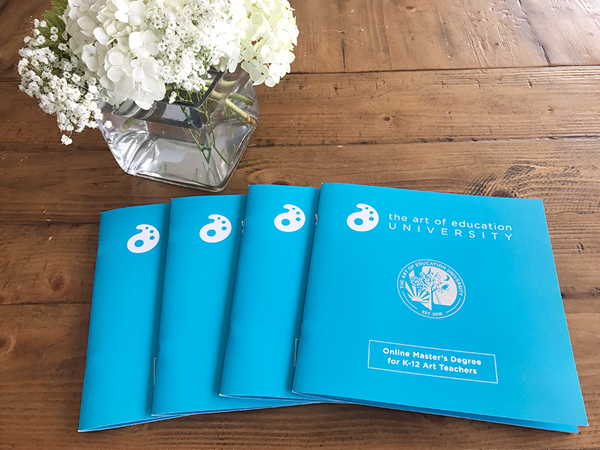 If you are interested in learning more about data collection, be sure to check out AOE’s class Assessment in Art Education. We added more simple assessments, artist statements and specific examples of how to collect and display data in the art room. 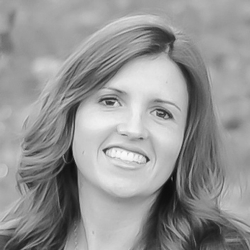 You will leave this class with a multitude of ideas and assessments ready to use now! Have you been asked to supply data demonstrating student growth? 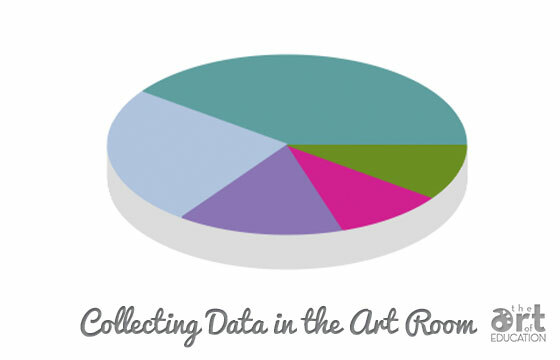 How do you collect data in the art room? whats the best way to record this data digitally? is there a template you’d recommend? i took pre and post tests of a color unit with 4th and just wondering how i can put all this data in. I had an xcel template but I’m wonderin if theres a better system. The link to Jessica’s portfolio cover sheet isn’t working. Is this still available? PLC’s are an issue for me. How do you work in a committee if you are the only art teacher? How do you work in a committee that no one shows up for? How do you not waste your mornings doing nothing but being frustrated?